Summarize the scheduling resources required for an instruction of a particular scheduling class. Defined as an aggregate struct for creating tables with initializer lists. Definition at line 110 of file MCSchedule.h. Definition at line 127 of file MCSchedule.h. Referenced by llvm::TargetSchedModel::computeInstrLatency(), llvm::MCSchedModel::computeInstrLatency(), llvm::TargetSchedModel::computeOperandLatency(), llvm::TargetSchedModel::computeOutputLatency(), llvm::TargetSchedModel::computeReciprocalThroughput(), llvm::SystemZHazardRecognizer::dumpSU(), getLatency(), llvm::TargetSchedModel::getNumMicroOps(), llvm::MCSchedModel::getReciprocalThroughput(), llvm::MachineTraceMetrics::getResources(), llvm::SystemZHazardRecognizer::groupingCost(), INITIALIZE_PASS(), llvm::TargetSchedModel::mustBeginGroup(), llvm::TargetSchedModel::mustEndGroup(), llvm::SystemZPostRASchedStrategy::releaseTopNode(), llvm::SystemZHazardRecognizer::Reset(), llvm::TargetSchedModel::resolveSchedClass(), and llvm::SystemZHazardRecognizer::resourcesCost(). Definition at line 130 of file MCSchedule.h. 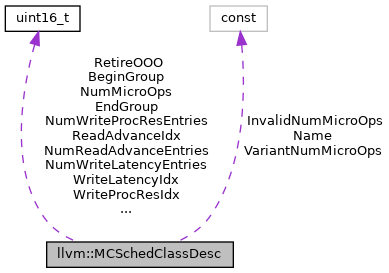 Referenced by llvm::MCSchedModel::computeInstrLatency(), llvm::TargetSchedModel::computeReciprocalThroughput(), getLatency(), llvm::MCSchedModel::getReciprocalThroughput(), INITIALIZE_PASS(), llvm::TargetSchedModel::resolveSchedClass(), and llvm::mca::verifyOperands(). Definition at line 118 of file MCSchedule.h. Referenced by llvm::SystemZHazardRecognizer::dumpSU(), llvm::SystemZHazardRecognizer::groupingCost(), llvm::TargetSchedModel::mustBeginGroup(), llvm::SystemZPostRASchedStrategy::releaseTopNode(), and llvm::SystemZHazardRecognizer::Reset(). Definition at line 119 of file MCSchedule.h. Referenced by llvm::SystemZHazardRecognizer::dumpSU(), llvm::SystemZHazardRecognizer::EmitInstruction(), llvm::SystemZHazardRecognizer::groupingCost(), llvm::TargetSchedModel::mustEndGroup(), and llvm::SystemZPostRASchedStrategy::releaseTopNode(). Definition at line 111 of file MCSchedule.h. Definition at line 115 of file MCSchedule.h. Definition at line 117 of file MCSchedule.h. Referenced by llvm::SystemZHazardRecognizer::dumpSU(), llvm::TargetSchedModel::getNumMicroOps(), and llvm::MCSchedModel::getReciprocalThroughput(). Definition at line 125 of file MCSchedule.h. Referenced by llvm::TargetSchedModel::computeOperandLatency(), llvm::MCSubtargetInfo::getReadAdvanceCycles(), and llvm::MCSubtargetInfo::getReadAdvanceEntries(). Definition at line 123 of file MCSchedule.h. Referenced by llvm::MCSchedModel::computeInstrLatency(), getLatency(), and llvm::mca::verifyOperands(). Definition at line 121 of file MCSchedule.h. Referenced by llvm::MCSubtargetInfo::getWriteProcResEnd(), and llvm::mca::initializeUsedResources(). Definition at line 124 of file MCSchedule.h. Referenced by llvm::MCSubtargetInfo::getReadAdvanceCycles(), and llvm::MCSubtargetInfo::getReadAdvanceEntries(). Definition at line 112 of file MCSchedule.h. Definition at line 122 of file MCSchedule.h. Definition at line 120 of file MCSchedule.h.